← Which Local Mayor Supported the early Pride celebrations in Grand Rapids? In Grand Rapids, the campaign to get an LGBT-inclusive ordinance passed took several years and two attempts to get the City Commission to adopt the ordinance. The campaign to pass an ordinance began in 1991 after the Community Relations Commission recommended that the ordinance be updated to include “gender orientation” into the language. The first time the ordinance was brought before the City Commission it was voted done 4 – 3, with lots of people at the first public hearing expressing their opposition to such an ordinance. Included here is a 1991 archival news story on the first ordinance hearing that was defeated. However, what is interesting about the businesses that actively opposed the ordinance in Grand Rapids in 1991 was the fact that many of those in the original list actually were NOT opposed to the ordinance. The list that was provided to the Grand Rapids City Commission came from Mike Beckett, a man who worked for a local insurance agency. He submitted a list of 140 businesses he claimed were opposed to the ordinance, which members of the LGBT community at the time believed influenced the Commission’s decision, which resulted in a 4-3 vote against the ordinance. Members of the LGBT community seemed to think that the list was not accurate and began contacting those listed to verify their stance on this issue. During this process they discovered that many of the businesses on the list did not oppose the ordinance and were never approached by Mr. Beckett about such a campaign against inclusion. Once Mike Beckett was exposed for his deceit he made a formal apology to the Lesbian and Gay Community Network, which published his apology in their August 1991 newsletter. Once the group had verified the real list of businesses that opposed the ordinance they decided to publish that list in the September issue of the Network newsletter. 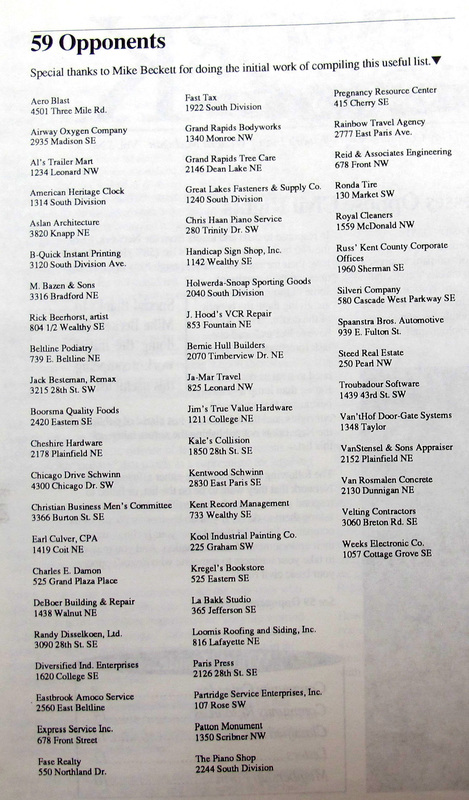 It is worth noting which businesses and individuals were on that list (included here) from 1991, a list that now included just 59 entities. After the accurate list was published there was no real push from the broader business community to oppose the ordinance, but there were some area families with significant wealth that made their opposition to equality for the LGBT community known by spending lots of money on campaigns to defeat such efforts. Some of the more prominent families used money from their foundations to support anti-LGBTQ campaigns in Michigan and abroad. These families include the DeVos family, the Princes and Peter Cook. For more information on these family foundation, click here. This entry was posted in LGBTQ Movement and tagged 1991 ordinance vote in Grand Rapids, anti-gay funders in Grand Rapids, Grand Rapids businesses that opposed LGBT inclusion, The Network newsletter. Bookmark the permalink.